We're putting our money where our mouth is: we want you at SUU. Get an estimate of your award and come join T-Bird Nation. 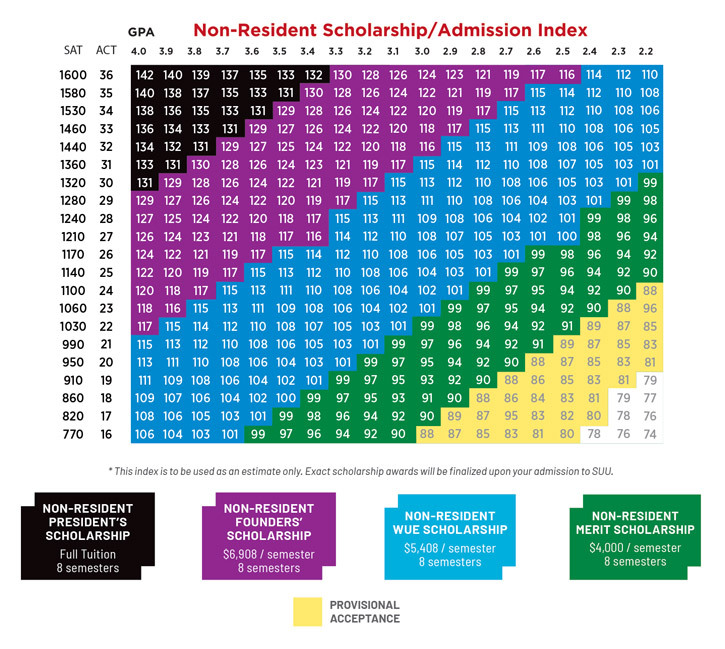 *The cumulative unweighted GPA is used for admission and scholarship purposes. *SAT score is based on Critical Reading & Math sections; NOT the Writing section. Total score will be based out of 1600. *The scores here are rounded and used for estimating purposes only. 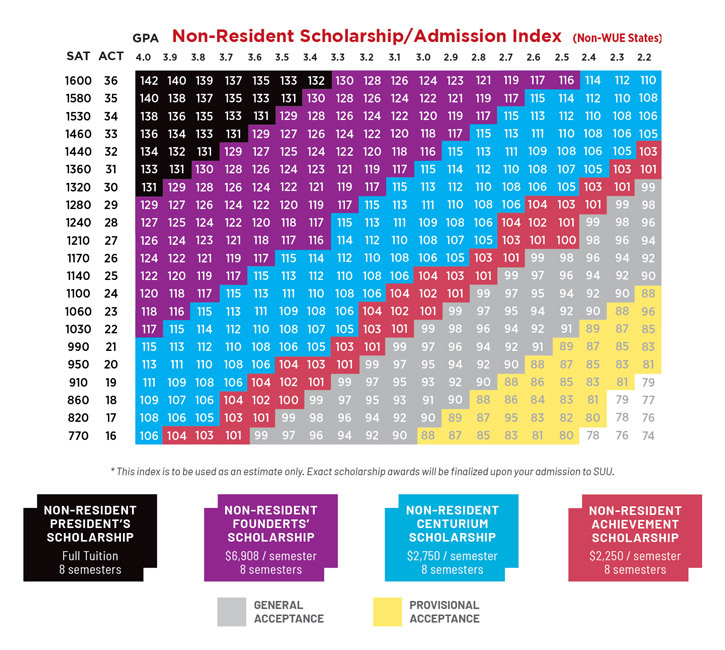 Scholarship awards are based on the exact index not the rounded score. *This index is to be used as an estimate only. 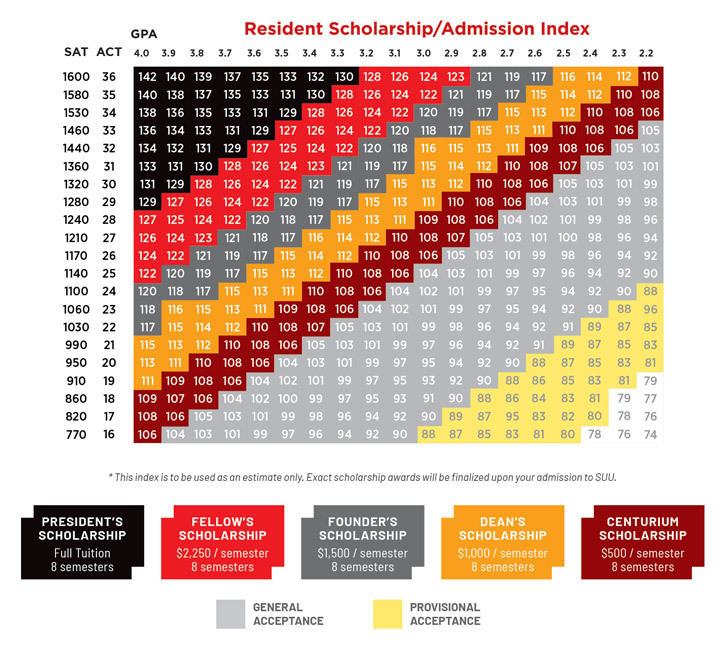 Exact scholarship awards will be finalized upon admission to SUU. Paying for college is easier than you think. Let us help! If you've been offered a scholarship, make sure you accept it! Already have a scholarship and need to defer? It's easy to see where you stand. Simply locate where your GPA and ACT/SAT score intersect. Priority scholarship deadline - December 1: Apply before December 1st to be considered for the best academic scholarships. Scholarship deadline - March 1: Apply before March 1st to be considered for remaining academic scholarships. President's accept deadline - March 1: Last chance to accept the President's scholarship. Accept scholarship deadline - May 1: Last chance to accept all other academic scholarships. We understand opportunities or emergencies happen; be assured we will be waiting for you when you get back. You may defer your admission for up to five semesters for the following reasons: religious mission, military service, humanitarian service, or medical leave.